Good morning! Brad and I have been up for several hours now and are making our way west toward Cherokee County and the NC/Tennessee state line. Just over the state line, we’ll begin our trek up Mt. LeConte around midday. In my absence, please enjoy some delicious and veggie-filled, light and refreshing, and did I mention absolutely beautiful dishes, by Adrienne, who blogs over at ADRIENNEEATS. When you’re done feasting your eyes on her delightful concoctions here, please click on over to her blog and show her some love for guest posting today. Memorial Day weekend kicks off the start of summer. Most of us will spend the weekend outside—maybe at the beach or lake—grilling out with friends and family. But as temperatures soar into the 80s the last thing you want to eat is a heavy, hot meal. 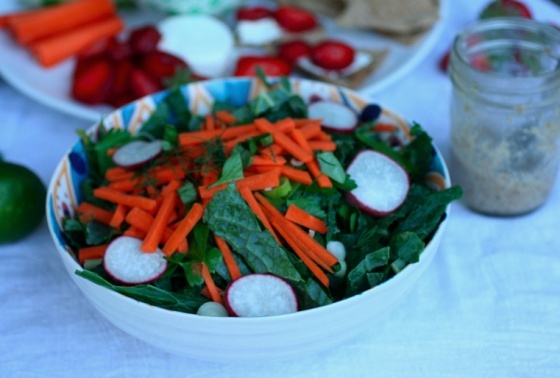 I thought I’d share some refreshing dishes to take to a potluck or cookout this weekend. These recipes are vegetarian friendly and won’t weigh you down. Hope you’re having a great holiday weekend! Kale’s easy to find at the farmers’ market right now. I love it cooked about as much as I love it raw. The trick to eating it raw is to massage the kale with your hands first. This will soften the texture and make it easier to eat. Feel free to add your favorite vegetables instead of the ones listed. Toss all ingredients together in a dish. Add the walnut sauce and massage into the salad well (yes, with your hands). Preheat oven to 350. Roast walnuts for 10 minutes. Remove from heat, crush walnuts and garlic together in a mortar and pestle until smooth. Move the paste-like consistency to a small dish and mix in the lemon juice and walnut oil well. Will keep in the refrigerator up to a few days. Who doesn’t love dips? 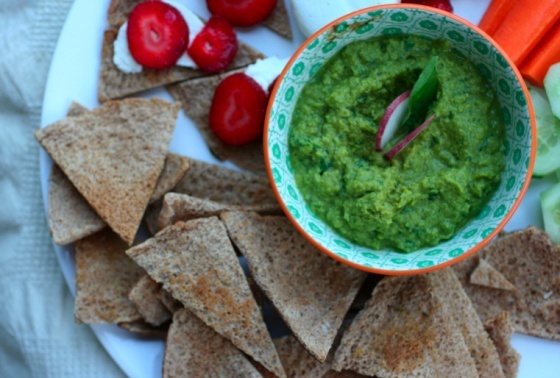 This basil pea dip is so easy to whip up and it tastes amazing. The sweetness of the peas mixed with the sharpness of the lemon and basil is hard not to love. 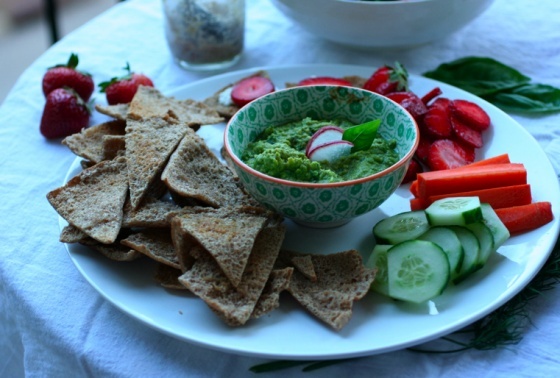 Enjoy a savory way to eat strawberries when they’re sliced and eaten with goat cheese on top of homemade pita chips. Cook the peas according the package directions. Strain and pour hot peas into a blender. Add remaining ingredients and blend till smooth. Preheat oven to 325. Take leftover pita and cut into wedges. Brush with olive oil. Bake for 10-12 minutes. Pita should lightly brown. Cook noodles according to package directions. Pour into a colander and rinse with cold water. Put noodles in a large serving dish. 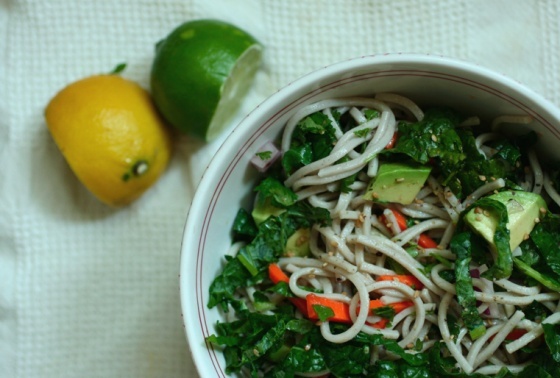 Massage the kale with you hands—before adding to the noodles—to soften the texture and make it easier to eat raw. Add kale, cucumber, avocado, onion and cilantro to the noodles. Mix vinegar, honey, tamari, lime, and gomasio. Add sesame oil, mix well, and pour over noodle mixture. Puree about 6 of the strawberries with the basil and honey. Add a tbsp of the mixture to a glass. Fill with ice, lime and strawberry slices. Finish off with sparkling water or soda. 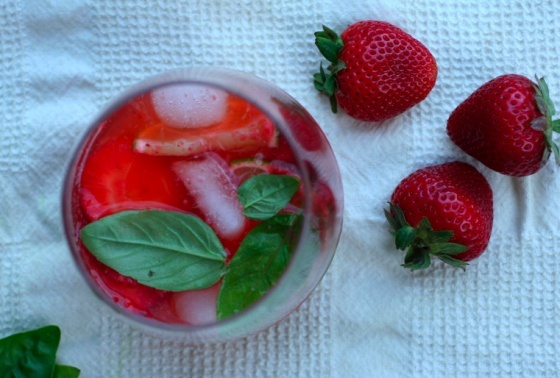 Mix well, garnish with basil. Thanks for such delicious summer recipes, Adrienne!